I hope you’re having a great start to your week? Today I wanted to let you know that one of my favourite stores, House of Fraser have been at it again with their amazing gift with purchase offers, and this time one of my favourite ever brands is offering a fantastic selection of products completely free! 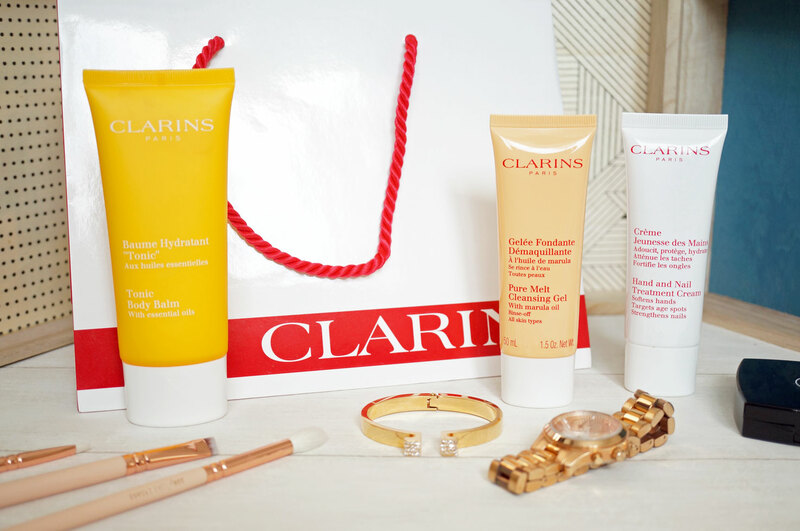 You just need to purchase two Clarins products from House of Fraser, with one of them being skincare, to receive this amazing set of three skincare products. The Tonic Body Balm alone is a full sized 100ml tube worth £31.00! Included in the set is the Pure Melt Cleansing Gel, 50ml – this a fabulous triple texture 3-in-1 cleanser designed for all skin types. This cleansing gel quickly transforms into an oil that melts-away every last trace of excess oil and impurities from your skin – including even the heaviest make-up. I love how water activates the gel, turning it into a silky milk that rinses skin clean, it also soothes and nourishes with Marula Oil for optimal radiance and comfort. And lastly the Hand and Nail Treatment Cream 50ml – this is Clarins’ professional, emollient-rich moisturizing hand cream, with soothing Sesame Oil and fortifying Japanese Mulberry. This moisturising cream forms an invisible protective “glove” that shields hands from the elements, keeping skin smooth and silky and minimising signs of ageing. It softens and comforts chapped, irritated and sore hands, and brings moisture relief to dry skin on hands. It also helps tostrengthen nails and condition cuticles for naturally clean, soft and youthful-looking hands. You can take a look at this amazing offer and the whole Clarins range stocked by House of Fraser here. I also have one of these sets to give away to one lucky reader! All you have to do is enter via the Rafflecopter widget below. This giveaway is open internationally and will run for one week. As always, if you have any questions please feel free to get in touch. Good luck!